We value Scotland’s diverse and minority ethnic communities, the contribution they make, and the important role they play in enriching Scotland socially, culturally, and economically. Our vision is that in 2030 Scotland is a place where people are healthier, happier and treated with respect, and where opportunities, wealth and power are spread more equally. Results from the 2011 Census in Scotland show that Scotland is becoming more ethnically diverse, with an increasing number of people who live in Scotland being born outside of the UK. The emergence of an increasingly multi ethnic population enriches our culture, providing opportunities to bring together new influences with old, creating a more diverse Scotland and helping ensure that our dynamic, progressive country continues to evolve. We need a long term approach to tackling the issues and solutions that are suggested from people with lived experience of the issues. We have created a Race Equality Framework which is based on the priorities, needs and experiences of Scotland’s minority ethnic communities, with expertise contributed by the public and voluntary sector and academics to ensure that the Framework is practical and deliverable. 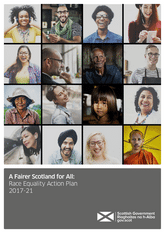 Scotland’s Race Equality Framework sets out the Government’s approach to promoting race equality and tackling racism and inequality between 2016 and 2030 and was published on 21 March 2016. During 2015, with support from the Coalition for Racial Equality and Rights (CRER), we engaged with a wide range of people from grassroots community organisations to practitioners working in the public and third sector and encouraged them to have their say about advancing race equality and tackling racism. Our engagement involved around 700 people from a wide variety of voluntary groups, charities, public sector organisations and citizens who took part in our strategic action forums and as part of the Community Ambassadors Programme. Each of the six themed Visions and related Goals set out in the Framework have been shaped by this involvement process. The first of these Visions sets out the overarching ambition for race equality in Scotland which we aim to achieve by 2030 with the other themes covering a cross section of outcomes related to community cohesion and safety; participation and representation; education and lifelong learning; employability, employment and income; and health and homes. We recognise that the actions needed to eradicate racism are not just for the Scottish Government alone. Every individual and organisation in Scotland needs to play their role in creating a fair and equal Scotland that protects and includes people from all backgrounds, regardless of ethnicity. In December 2016, the Scottish Government appointed Ms Kaliani Lyle as the independent Race Equality Adviser to help drive forward the implementation of the Framework and to champion race equality more generally. Having considered how we might improve race equality, Ms Lyle published her report entitled “Addressing Race Inequality in Scotland: The Way Forward”. Her report concentrates on those key areas she feels we can “make a difference to the lives of people on the ground”. The Scottish Government is determined to show leadership in advancing race equality and published the Race Equality Action Plan on 11 December 2017. The Action Plan builds on the Race Equality Framework for Scotland and is informed by the work of independent Race Equality Adviser. The publication also includes a Highlight Report setting out progress made on implementing the Race Equality Framework from March 2016 to Autumn 2017. It outlines over 100 actions that will be delivered over the course of this Parliament in areas of employment, education and lifelong learning, health, housing, poverty, community cohesion and safety, and participation and representation to make real improvements in the lives and experiences of minority ethnic communities in Scotland. The Action Plan also highlights specific Scottish Government led activities for the Gypsy/Traveller community, including the establishment of a Ministerial Working Group. Get more details about race equality.